UHD Davies’ full-time MBA program enables students to earn an MBA degree in one year. Depending on the concentration selected, students must complete 34 to 39 semester hours to complete the MBA program. Each semester consists of two eight-week terms. Each MBA core class meets for two hours a week from 6 p.m. to 7:50 p.m. or from 8 p.m. to 9:50 p.m. for eight weeks. Concentration classes meet one night a week from 7 p.m. to 9:50 p.m.
UHD’s “flipped classroom” concept means that class lectures are recorded and made available before the scheduled class. UHD School of Business also operates under a team-teaching approach. Each course is taught by two teachers — a College of Business professor and a “Corporate Fellow,” a seasoned expert from the corporate community, and results in students gaining a comprehensive understanding of both theory and practice. UHD offers MBAs in the following concentrations: accounting, business development/sales management, finance, human resources, international business, investment management, leadership and supply chain management. MBA students also take core classes in strategic management, managerial accounting and budgeting, marketing management, managerial finance, management of the supply chain, management of information systems, managerial decision making, managerial economics, management of organization behavior, as well as a capstone course. Students who have earned an undergraduate degree in a field other than business may need to complete one or more “leveling” courses to prepare them for graduate study. UHD’s student body is extremely diverse, with 47 percent Hispanic, 25 percent African-American, 17 percent white, 10 percent Asian-American and 2 percent foreign students attending the university. The overall diversity is reflected in the full-time MBA program. At $532 per credit hour for in-state students, tuition for a full-time Davis UHD MBA varies depending on the concentration. Students concentrating on finance, human resource management, leadership management, or business development/sales management will pay $21,840 in tuition fees. Concentrations in supply chain management, international business or accounting cost $23,940. An MBA with a general management concentration costs $18,088. Out-of-state students pay about $28,300 and out-of-country students pay around $28,500. 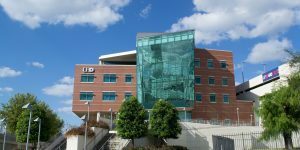 The UHD Office of Scholarships and Financial Aid offers a number of financial aid programs, including scholarships, grants, loans and work-study. Official transcripts from other universities attended, official GMAT scores, two letters of recommendations from professional references, a personal statement about why they are pursuing an MBA and a résumé. Under certain circumstances, on a case-by-case basis, the GMAT requirement may be waived. Students who attended a foreign university must also submit an official TOEFL score report. The application fee is $35. The application deadlines for fall admittance is July 15. Applications received after that date will be considered for spring admittance. Are Business School Neighborhoods Becoming More Gentrified?